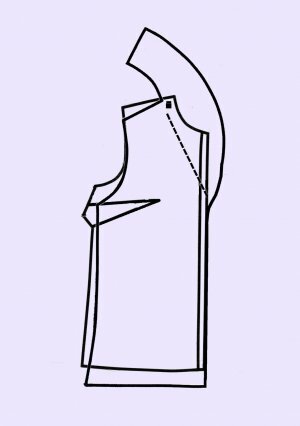 If you are doing a jacket with a mandarin or peter pan collar, match the neckline of your custom fit pattern as closely as possible to the chosen collared jacket pattern. For the front pattern pieces always match up from the center front lines to the shoulder seam. Note which size matches most closely to your custom fit pattern. Then match up the back necklines to make sure that the same size is the best match. If the back matches up to a different size choose the larger of the two sizes, and use the corresponding collar pattern. Use that collar with your custom fit jacket pattern. If none of the available collar patterns are long enough you may add length to the collar at the center back. marked with a diamond. See illustration. 2. 2. Layout the shawl collared front pattern piece on a table. 3. 3. Place your custom front pattern piece on top matching up the center front line. 4. 4. Then match up shoulder widths and note which shoulder width size is the best match. Do this by measuring across the shoulder width from the spot to the armhole. 5. 5. 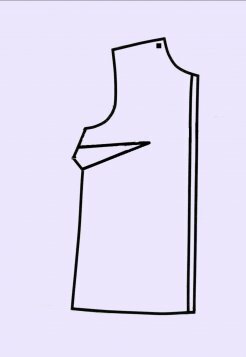 Stick a straight pin through the spot you previously marked at the corner of the shoulder and the front neckline and the small square on the shawl collared pattern that matches your shoulder width. The shoulder line may be at a different angle but the length of the shoulder line should be the same. If it is not than try a different small square spot on the shawl collared pattern. 6. 6. Now trace around your custom pattern onto the shawl collared pattern from the corner by the spot across the shoulder, around the armhole, down the side seam and across the hemline. You now have a brand new customized front pattern piece. Use your old custom back and sleeve pieces to complete your own customized shawl collar jacket.